Last post, I described how nerve impingement in my back lead to dermal stress that included numbness, uncontrollable itching, crawling sensation in the skin, lesions, and a disturbed mental state from not knowing the cause. If I had addressed the symptoms with a physician, he most likely would have passed it off as a mental illness. I can hear the words now, “if you would just stop scratching the skin, it will stop itching and heal.” Most physicians have not been exposed to this type of trauma, and as the deficiency in vitamin D becomes worse in the general population, I would expect to see more of this type of dermal stress. I remember well the last time I addressed the rash on my leg with my neurosurgeon and suggested that it was caused by the nerve impingement in my back. He just looked at me in disbelief. As many of you know who are regular readers, my spine healed except for the disc between L4-L5. I had two surgeries performed at this location. The disc has all but dissolved or disappeared according to the MRI’s that I had done. Even though there is no disc, the vitamin D and other nutrients and exercises that I do control the pain well enough that I do not need a spinal fusion at this point. I do not have pain in my back and I am willing to put up with some numbness that moves about on the left leg and foot. The nerve impingement on L4-L5 left changes as the two vertebrae move trapping the nerve. Depending where on the left nerve root the impingement occurs, results in different locations of numbness on my leg and foot. Because there is no support at this location, sometimes the nerve on L5-S1 becomes involved as well. This happened this past week. If you will observe the foot on this dermatome, you can see the dermal nerve pathway between L5 continues through the fourth toe of the foot. This past week there was an uncontrollable itching in this area of my left foot and numbness that was felt through the center of my foot between the toes and the ball of my foot. It also felt like there was something crawling under my skin on this foot. The fourth toe was particularly irritated. After two days the lesion showed here appeared on my fourth toe. Please note the angular position of the small toe is a result of a stress fracture that I received in college that was not properly set. Upon closer examination, you can see the dermal nerve fiber that is in stress that caused the wild sensations in my toe and the lesion. I have drawn arrows pointing out the dermal nerve. Dermal nerves are not normally this easy to see. They typically ‘hide’ under the dermal layers. Because the nerve was stressed it is easier to see. These photos were taken two days after the initial irritation began. I was traveling and not able to decompress the lumbar region in my back to relieve the nerve stress. After two more days I was able to decompress on my inversion table and the lesion looked as shown here. The itching, numbness, and crawling skin stopped shortly after the first decompression attempt. 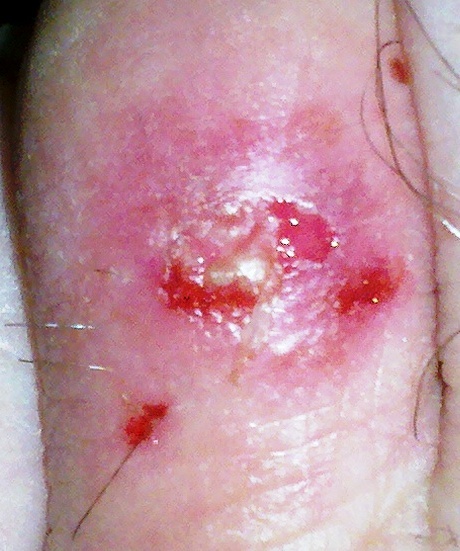 You can see from the photograph the lesion has turned into a normal looking wound that is in the process of scabbing over to heal. Also please note that the dermal nerve has disappeared as it is no longer in stress. I do believe that this is exactly the same thing that has been described as Morgellons Disease or Syndrome. It amazes me that the neurologists have not been able to make the connection between the nerve involvement in the back or point of nerve origin and the dermal eruptions along mapped nerve pathways. The thing that has stumped the physicians that were examining the dermal lesions in Morgellons Syndrome, are the fibers that appeared. The fibers have been tested and were found to not be of any known fabric. It should be easy to test the fibers to see if they are consistent with a myelinated nerve fiber. The stressed nerves fibers that I have seen in the past will become black as they die. It has been reported in Morgellons that the fibers had other appearances and may be the result of the degree of myelination of the fiber. I have noticed that some relief can be obtained from the itching by increasing the amount of potassium intake. After more potassium, the feeling in the concerned areas is more like numbness and pain than the itching crawling sensations. I suspect his is due to the firing along the nerve axons with the potassium and sodium gates and pumps and the availability of potassium. Ah, the difficulty of being a physician in an insurance and government controlled health paradigm. If it is not written in the medical literature, then physicians will not make the leap necessary to make a correct diagnosis to prevent personal attacks on their credibility and liability exposure. I have often wondered if it was just incompetence. I now believe this failure to diagnose is more about personal safety and protection of the doctor and the fact that most are over worked. Just read your article on itching, etc and the spinal nerves, etc.. and using potassium for some relief, Vitamin D, etc. I have been tortured with itching, stinging, crawling sensations, burning on my back for several years now – about four years to be exact. It started as itching and has progressed as the years have gone by. I have seen several doctors and none know what it is. One nurse practitioner told me it is nostalgia paresthetica. I have tried cortisone creams and all kinds of rx meds, capsacin which burned the hell out of my back until I was screaming in pain. One damn dermatologist said to me when he walked in the room after his asst. told him I said I was tormented with this said “You don’t look tormented to me”. I have been to a spine dr, who said nothing is wrong with my back after x-rays. One spine dr said he didn’t know what I was doing coming to him. A neurologist I visited also doesn’t know what this is. Two Dermatologists told me they cannot help me. The dr. I am going to know, a D.O., is the only one who is truly trying to get me relief from this. She ordered a TENS Unit which didn’t really help much, and I’ve gone to Physical therapy, which also didn’t do much for me. My dr. is going to send me to either an acupuncturist or another neurologist. In the last 6 months I have been diagnosed with Degenerative Thoracic Spinal Disease, and I believe this may be what is causing my problems with this horrid back of mine. I am at the end of my rope with this, being in pain night and day. So I suppose the nurse practitioner is the correct one a that is to do with my spinal nerves. She told me I’d have to go back to my primary for help, which I did andhe did not help me. Apparently none f these so called “professional” drs. don’t give a damn or don’t care to research this. Anyhow I am going to start taking potassium, go the new neurologist and I think I will print out your article and show him this. It is awful to be in agony all the time with this and not to many people have empathy for it.